The HH-43 “Huskie” was intended to be used primarily for crash rescue and aircraft fire-fighting. However, the build-up of air forces in Southeast Asia in 1964 threw the Huskie and her crews into a Combat Search and Rescue (CSAR) Mission which they adapted to quite well under the circumstances. 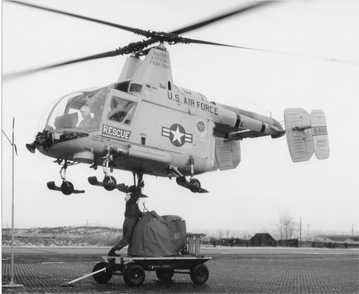 The delivery of the H-43As to the USAF Tactical Air Command began in November 1958. Delivery of the -B series began in June 1959. 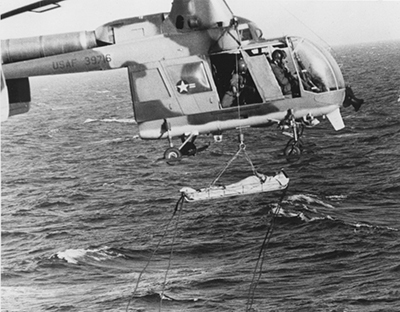 In mid-1962, the USAF changed the H-43 designation to HH-43 to reflect the aircraft’s rescue role. The final USAF version was the HH-43F with engine modifications for improved performance, and an armored skin. -F Models were used in Southeast Asia as “aerial fire trucks” and in a Combat Search and Rescue role rescuing downed airmen in North and South Vietnam, Laos, Cambodia, and Thailand. A Huskie “Cocked” and on rescue alert could be airborne in approximately one minute. The crew positions varied depending on the mission. A typical crew could be comprised of the Pilot and Co-Pilot, two Rescuemen/Fire-fighters and a a Parajumperescueman (PJ) or Flight Medic when “scrambling” in its Crash Firefighting Role, with a Fire Suppression Kit (FSK) hanging beneath it. It often reached crashed airplanes before ground vehicles arrived. Foam from the kit plus the powerful downwash air from the rotors were used to open a path to trapped crash victims to permit their rescue. A typical crew in its CSAR Role and Medevac Role usually consisted of a Pilot and Co-Pilot, PJ, and Flight Engineer. Huskie crews were quite adaptable and the Pilot or Aircraft Commander could man his crew to fit his perspective of the upcoming mission. An HH-43B, Serial #60-263 established seven world records in 1961-62 for helicopters in its class for rate of climb, altitude and distance traveled. It was assigned to rescue duty with Detachment 3, 42nd Aerospace Rescue and Recovery Squadron, Kirtland AFB, New Mexico, prior to its retirement and flight to the Air Force Museum in April 1973. 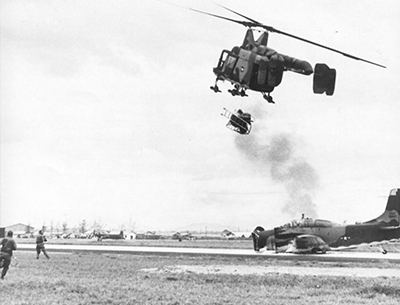 An HH-43 equipped with a fire bottle is the first to arrive over an A-1E that bellied in at Da Nang AB. Rotor diameter: 47 ft. 0 in. Overall length: 47 ft. 0 in. Height: 17 ft. 2 in. Engine: Lycoming T-53 of 860 hp. An Air Force HH-43 Huskie Helecopter rescue over the South China Sea.